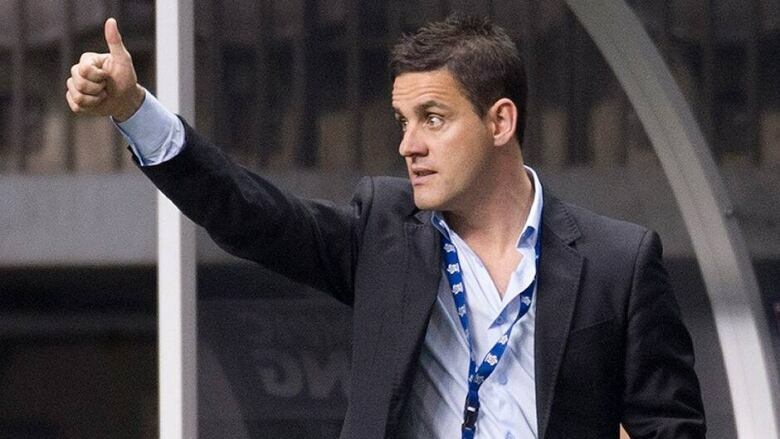 The Canadian Soccer Association has given women's head coach John Herdman a vote of confidence, extending his contract through the 2020 Summer Olympics. The man who coached the Canadian women's soccer team to a historic bronze medal at the London Olympics has made a long-term commitment to remain with the program. John Herdman said extending his contract with the Canadian Soccer Association through the 2020 Summer Games gives him the chance to build on what has already been accomplished. "It's a wonderful opportunity to be able to lead a legacy," the told a news conference Thursday. "We have been planning for a 10-year plan since I came into the organization. "To know you can actually see that through and you've got the backing and support of people, it's a great place be a leader." Peter Montopoli, the CSA's general secretary, said the agreement brings continuity to the women's team. Herdman's previous contract ran through the 2016 Olympics in Rio de Janeiro. Canada will host the 2015 FIFA Women's World Cup with the championship game being played at BC Place Stadium in Vancouver. Herdman will now also guide the program through the 2019 World Cup and 2020 Olympic Games. "John is the inspiration and the leader of the program," said Montopoli. "There is nobody better in the world that we believe can lead the program." Herdman, an Englishman, took over the Canadian women's program in 2011. The bronze at the London Olympics was the first Canadian medal in a traditional team sport at a Summer Games since 1936. There had been speculation Herdman could leave the CSA after Hope Powell, the long-time coach of England's women's team, was fired this summer. Family and friends were calling Herdman, asking him if he was coming home. "You're grandma is ringing, your mom's ringing, your brother," he said. "Everyone is saying you are coming home." Herdman said the situation in England "brought some real clarity" to what he wanted to do in Canada. The 38-year-old father of two said his wife and family enjoy living in Vancouver, adding "Canada is where we wanted to be." Montopoli said the CSA had been speaking with Herdman about an extension for a number of months. "No matter what was happening in England or not, it was something that was going to happen," he said. "It just took some time." National team veteran Sophie Schmidt said it's a relief knowing Herdman isn't leaving. "It's comforting," said the midfielder. "As soon as I heard news about the whole English thing I had this unsettled feeling in my stomach. "He means so much for the team. It's such a relief to know that he's here for a significant amount of time." Part of Herdman's long-term vision is to improve development programs in Canada to produce more players like national team captain Christine Sinclair. "Now the things that we planned we can progressively put in place so we have a world-class women's national team [and] a world-class development system that underpins it," he said. "We've always said the women's national team is the priority. But realistically, unless the conveyor belt is right, then we won't see more Sinclairs very often. We have to have more Sinclairs, more often, to keep this team on the podium consistently." In time, Herdman may step away from coaching. "Hopefully I'm not coaching in the 2019 World Cup or Olympics," he said. "One of my goals would be to have women leading women moving forward. I would love to see one of these national team players, with all their experience, stepping forward into that role. "When they are ready, somebody will do that, but you have to be ready. You have to have someone with those world-class capabilities." Schmidt said defender Carmelina Moscato or midfielder Diana Matheson have the potential to be future national team coaches. Montopoli said Herdman's long-term role hasn't been defined. "He will certainly be involved in women's football across the country. It will develop. It will be evolving," Montopoli said. "Certainly John will be overseeing almost everything that is going on, on the women's side." The CSA also announced the women's team will play Mexico in an international friendly Nov. 24 at BC Place. Canada beat Mexico at the Olympic qualifying tournament in Vancouver to advance to the London Games. Herdman said he will use that game to introduce some new players to the lineup. "It won't be the same people playing as we've seen back two years ago," he said. Herdman was head coach of the New Zealand women's national team from 2006 to 2011. He joined the Canadian program after former coach Carolina Morace quit following Canada's last-place finish at the 2011 Women's World Cup in German. Under Herdman, the Canadian women won the gold medal at the Pan-Am Games in Mexico later that year before reaching the podium in London. Herdman understands the team now faces high expectations. "As soon as you get on a podium expectations are up," he said. "The goal for us is Canada should be able to podium consistently."